In this podcast, the last of our 4 with a ‘Time’ theme, Steve Hall interviews Matt Piper, a researcher from the UCL Institute for Healthy Ageing. Steve Cross spouts his usual rubbish while the guests try and understand what ageing is, how you can slow it down, and what it means to live longer. Unfortunately, most of the healthy living advice generated (“don’t drown in rotten fruit” for example) is only immediately relevant for fruit flies. This podcast was supported by the Science and Technology Facilities Council. Lovely people. As ever, the opinions expressed in this podcast are not necessarily those of Bright Club or of anyone’s employers. They’re usually not even our opinions – we really will say absolutely anything to try and get a laugh. Download links are on the right, or you can click on ‘PODCASTS’ up top. Finally all the football will be done. Time to stretch out on a sunny bit of grass somewhere and read a book. But which book? 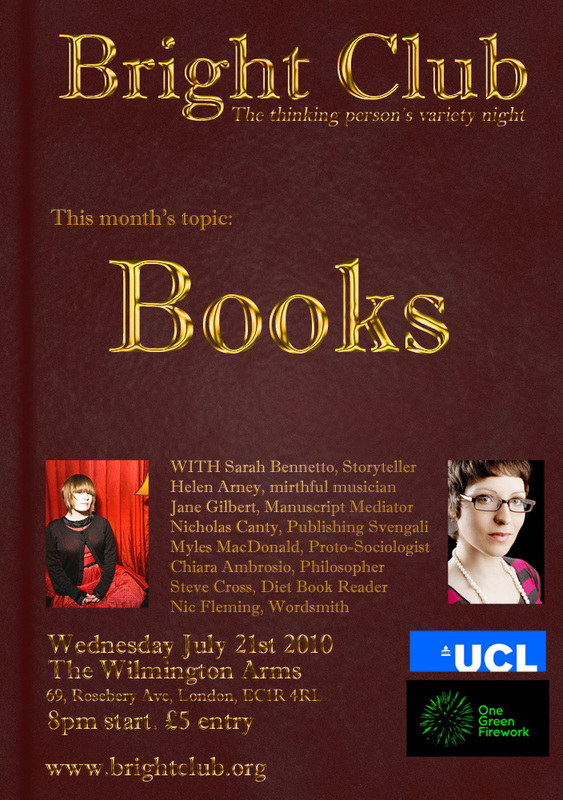 Join another cast of intellectuals and funny people at the Wilmington Arms (“It’s coming home. It’s coming home. It’s coming…”) for a night of laughing out loud, rolling on the floor laughing, and laughing your asses off. Wow. That took a long time to type. I wish someone would invent some way of typing those activities more quickly. Sarah Bennetto, Comedian (http://www.myspace.com/sarahbennetto) who tells some of the funniest stories in the world. Jane Gilbert, French Manuscript expert, who has translated some very strange and hilarious stories. Nicholas Canty, Publishing Guru and information master. Myles MacDonald, young sociologist and Youtube star. Steve Cross, the coach of Bright Club, putting himself into the game to reveal his diet book addiction. and many more very, very funny people. Free sweets! £5 to get in! Turn up nice and early (doors 8pm) to get a seat. Podcast seven features Ian Hamilton of the UCL Energy Institute, trying to explain to Steve Hall (We Are Klang) and Steve Cross, Bright Club’s regular anchor and ignoramus, about energy use in buildings. We find out that Britain has the worst buildings in Europe, that Canada has an army, and that ill-informed men from London shouldn’t start talking about Japan without proper supervision. This podcast is supported by the Science and Technology Facilities Council. Thanks guys! Food. You love it, we love it. My face is full of it right now and there are cake crumbs on my keyboard. It’s a good thing that there are people who can help us make sense of it. Bec Hill joked about milk, and ran the Wilmington’s first-ever food-themed quiz. One lucky punter won some fish sauce! Debbie Challis channeled the spirit of a Roman rake, and took us into the seedy depths of dinner-party culture. Laura Ishiguro read the letters of men in frontiers America, and shared their frightening diets and eating habits. Stuart Hine revealed that we can eat insects, but they are going to eat us in return! Sanna Hirvonen debated whether there is such a thing as good taste, and whether Brits could ever be accused of having it. James Kneale told us that the victorians had it rough; Nasty beer and urinals at the bar. and Strawberry and Cream brought a smorgasbord of great music to the table. Delicious! Subhadra Das, UCL’s cultural property advisor and general museum experts, talks to Steve Hall (We Are Klang) and recurring Bright Club idiot Steve Cross. She tells us why she hates Lara Croft, why she loves a good collection, and why no museum lives up to her high standards. This week we present the first of our ‘Time’ podcasts, supported by the Science and Technology Facilities Council. This week Joe Flatman, archaeologist, and Steve Hall, comedian and member of We Are Klang, discuss cake, stratigraphy and well-dressed lotharios. Anchored, as ever, by Bright Club’s very own idiot, Steve Cross. 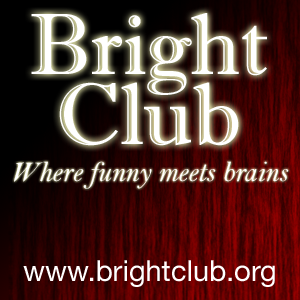 March saw Bright Club take on Crime, with a line-up assembled by Bright Club team member and expert photographer Hilary Jackson. Michael Fabbri took us through his days of meeting criminals in weird places. Alex Braithwaite exhorted us to laugh in the face of terror. Kathy Tubb revealed the crimes against antiquity happening in Iraq right now. Tom Stern explained that we all love to suffer really. That’s why we punish crimes. Celia Morgan looked at the drug laws, and some other activities that are a bit more dangerous than taking ketamine. Chris Abram asked who is more gangster, a viking poet or a rapper? and Colin Hazel played us beautiful songs about very, very bad people.